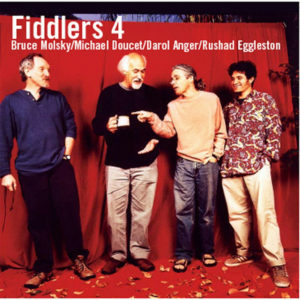 Fiddlers 4 is a gathering of some of today’s most celebrated fiddlers. Michael Doucet is well loved for his work as the leader of Cajun supergroup Beausoleil. Darol Anger, a veteran of the David Grisman Quintet and founding member of the Turtle Island String Quartet, is the leading exponent of jazz-hued newgrass. Bruce Molsky is internationally revered as a leading old time fiddler and Rashad Eggleston, a hot newcomer cellist, is lauded for his scorching hot technique. Each has made a major musical statement and helped revolutionize their field, inspiring numerous emulators and new genres. Their repertoire spans a heroic reach of American culture, covering the spectrum of American fiddle, from the oldest dance tunes to sophisticated jazz sounds, with singing and stories. On their debut album, these four master musicians create a cross-cultural fiddling extravaganza, with stops in the Louisiana bayou, the Appalachian mountains and the Marin foothills. On tracks such as You Little Wild Thing (La Betaille), Cajun master Michael Doucet sings with the passion that launched his group Beausoleil to the forefront of Cajun music makers. Pickin’ the Devil’s Eye is an adaptation of the old time standard that gives each fiddler a chance to dazzle. Fiddler players across the world are coming together and realizing the great potential of fiddle music to move and inspire all ages. In this spirit, these influential and accomplished musicians have joined forces to create something beautiful and new out of very old cloth. Michael Doucet brought Cajun Music out of obscurity to joyful public acclaim. Michael’s super-charged fiddling and singing powers his two-time Grammy award-winning group Beausoleil, by far the best known Cajun band in the world. With his constant research and vast knowledge of Acadian history, Michael has not only preserved an essential part of American culture, but moved it forward into the mainstream. Beausoleil, now in its 25th year and a regular guest on NPR’s Prairie Home Companion, composed and played the music for the feature film Belizaire The Cajun, and has released a score of best-selling recordings on Arhoolie and Rhino Records. Bruce Molsky has been dubbed the “Rembrandt of Appalachian Fiddling” for his brilliant mastery of regional styles, encyclopedic knowledge of tunes, and especially his supercharged and entirely personal rhythm, which has been known to break glass, explode closed containers, and compel dionisian episodes of involuntary dancing. Renowned musicians Tommy Jarrell and Albert Hash were two of Bruce’s mentors in the Blue Ridge Mountains where Bruce learned to play. He has been featured in Acoustic Guitar, Fiddler Magazine, Dirty Linen, Acoustic Musician, and other magazines. His three recordings on Rounder Records have created an unprecedented stir in the rapidly growing world of old-time music, and he is accomplished on guitar, banjo, and vocals. Rushad Eggleston is an enormously talented cello player, a master of improvisation and fiddle styles on a relatively unwieldy instrument and has already done things that nobody has done with the cello. He was the first stringed instrument student admitted to the prestigious Berklee School Of Music on a full scholarship. A newcomer to the professional community, Rushad brings an element to Fiddlers 4 that helps make the dream of a truly masterful American Vernacular String Quartet a reality.